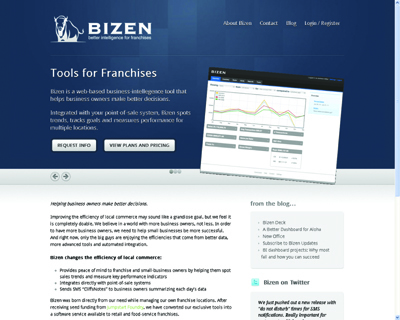 Bizen provides business intelligence tools for franchises, restaurants, and retailers. Their tools integrate directly with common point-of-sale systems like Aloha, Micros, Positouch, Dinerware, Restaurant Manager, DRS, and more. Bizen reduces ambiguity by focusing on the key performance indicators. Bizen’s tools are designed for location managers to be able to easily understand and use. Bizen also provides SMS notifications daily so that owners and managers can be aware even when they are off-site.